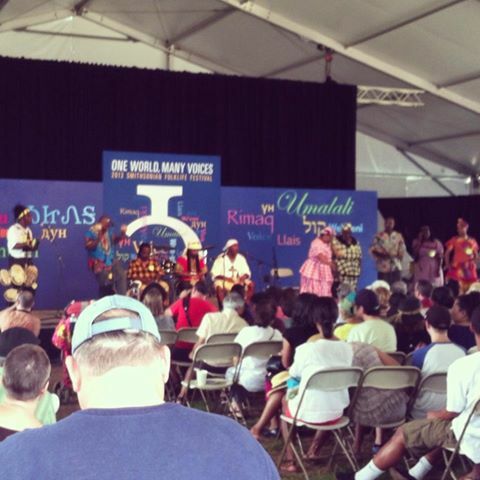 Since I first heard about the Smithsonian Folklife Festival back in February of this year, I knew that it was one of the first things that I (a recent DC transplant) needed to check out. Although I am not one to be aware of important social events at any given time (I completely forgot that the President’s inauguration was happening in my city, and actually made plans to go out of town that weekend), I try to stay on top of any cultural happenings, especially if they are related to music. Needless to say, I was very surprised that I had never heard of the Folklife Festival prior to learning about it in class this past spring semester. Although it takes place arguably during the hottest week in the year in Washington D.C. (right around the Independence Day holiday), there were droves of locals and tourists who had showed up to witness the Festival. The theme was “Hungary,” and the area of the Festival was split into two areas, those with programs about Hungarian culture, and a second half, which was dubbed “One World, Many Voices,” and had stories, songs, food, and dance from cultures all over the world, specifically those that have endangered languages and cultures. I was somewhat unsure where to head first, so I decided to go over to the Hungarian programs, since that was the theme for this year. I witnessed traditional Hungarian dancing (in which both Hungarians and Americans were involved), traditional Hungarian cooking (with a really cool overhead mirror so that the crowd could see how the food was being prepared), and traditional decorative furniture. I was able to listen to a bit of music over there, played by a man who makes traditional Zithers as well as other instruments. He played for us a bit, and was answering questions about the instrument. Although I was intrigued, and wanted to stay for a while longer to hear this man speak about his craft, I had to be satisfied with him answering a few questions, as I was trying to experience everything before the day was over. I headed over to the second half of the festival, and was instantly drawn to the tent emitting a vibrant, exciting kind of music made for dancing. I learned that these were the Garifuna people—an African diaspora culture mainly found in coastal regions of Central America, but also in New York City and Los Angeles. They were here to party, and everyone in the audience had the party vibe too: everyone was dancing, singing, clapping, or shouting. They were amazing, and I only wished that they could play for longer. Folks movin’ and groovin’ at the performance. I was able to learn more about the Garifuna people over at their tent, where they had instruments, photos, and books documenting the history of their culture. There were also a handful of Garifuna people there that you could talk to. I was excited to get over there and start asking them about their music: how it’s passed down through generations, or if they have music “masters” in their culture, things like that. I learned that their music is heavily based in percussion and dancing—two things that were obvious from their performance. What was not obvious, however, was that their music (unlike most other traditional African diaspora music) was not recorded or historically documented until the mid-1990s. Equally as shocking was the lack of people coming over to talk with the Garifuna people, seeing as the performance was packed. This made me think a bit about the divide that sometimes exists between endangered intangible cultural heritage and the general knowledge of the culture. Many, many people were enjoying the Garifuna music as entertainment, but where was everyone looking to learn more about the culture and its history? Although I’m not one to break up a party, I feel as though some element of teaching should have occurred during the performance. That way, people could have learned more about this endangered culture while still enjoying the show. All in all, I think the Folklife Festival was a great way for others to experience the society and history of some endangered cultures. It would be even better though if we could have learned a little bit more while we party.